We have several productive fruit trees at the top of our garden and a few others scattered around. We also have many currant and berry bushes. 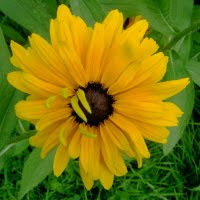 We don't know the varieties of most because they were here when we came here. Small eating apple: Very prolific even in very poor years like 2011 we get some. Sweet and keep well. Bramley: Suffers from the usual one-year-on one-year-off syndrome. Produces large cookers, green with redish tinge. Large apple cooker/eater: Very large apples which cook well in pies and chutneys but are sweet enough to eat if you like a little sharpness too. Russet: Small yellow-brown eating apples. We moved this tree 7 years ago because it was too close to the vegetable plot and it has flourished in its new location. Doesn't keep but is good to eat and also makes good baked apples. Red eater: This is a fairly small tree which produces bright red, delicious apples that keep well. Elstar: Eating apple. Produced one very large fruit the year we planted it (Easter 2008) but not a lot since - but this year (2015) it's loaded..
Braeburn: Bought spring 2011and still in a pot with a few small apples. Crab Apple: very prolific, red/yellow fruits - makes superb Crab Apple Jelly, juice and vinegar. Large, quite old tree in the main garden: Produces lovely medium-size plums for eating, cooking, bottling and jam. This one has sadly gone now. It just died without any warning - as some trees and shrubs do. Small(er) plum tree: Very similar to the one above, located at top of the garden in the orchard. Four years ago there were so many plums it literally tore itself apart. It's recovered now and has been giving good harvests most years. Purple plum: Produces few medium-size plums, tasty but not many. Small Purple plums: More like large damsons, this tree fruits early and is great for dark red plum jam. 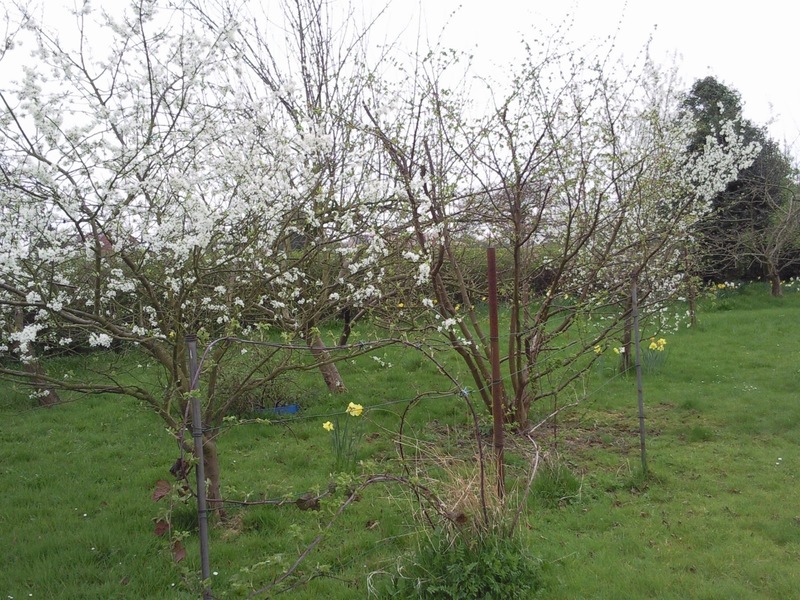 Victoria Plum: Bought in spring 2011 and still waiting to see what it can do! Planted out last year - and this year has produced three beautiful Damsons! Damson: Smallish tree produces lots of purple damsons in a good year. great for damson vodka (and subsequent damson vodka chocolates! ), damson jam and this year we did damson chutney. Williams or Comice pear: We had a good crop the second year we were here, but generally not a good cropper. Have to eat the pears right away. Conference pear: We bought this in Easter 2008 and it's turning out very well. Quite a few pears in 2010 but none last year. 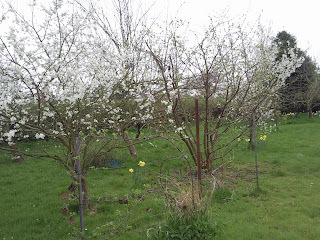 Covered in blossom this spring 2013 and half a dozen fruit. Conference pear 2: Bought this in spring 2011 and it's still in its pot. Some nice blossom so hopefully we'll get some fruit this year. The pears seem to suffer from a black-spot-type fungus which affects the leaves and the fruit. In early spring 2013, before the blossom opened, I sprayed the bark and branches with a wash supposed to kill fungus and bugs. Seemed to improve but probably need a few years' treatment to eradicate completely. Morello cherry: This is a very small tree but produces a few tasty cherries. It's under the shadow of the very big wild cherry tree which dominates the garden. Have to move fast to pick the cherries before the birds get them. Stella cherry: Bought this in spring 2011 and planted out by the lilacs. A handful of perfect, delicious cherries in summer of 2013 but none since.